The airspace security solutions developed by ASD have been chosen by Airbus Helicopters as part of the development of its Skyways project in Singapore. Our identification and monitoring solution has been particularly appreciated for its performance in saturated urban environments. 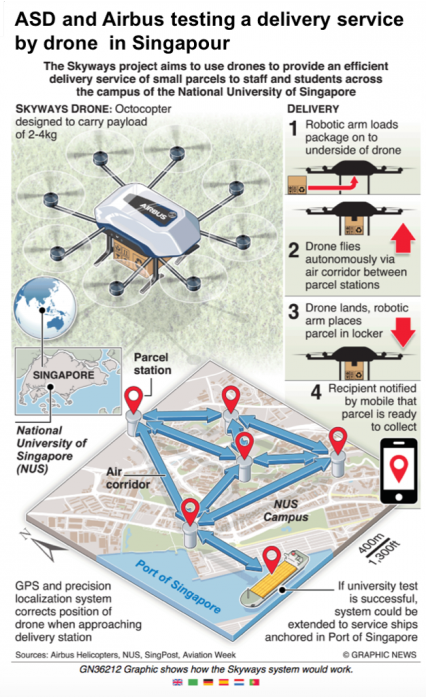 Skyways is a delivery service by drone in urban environments led by ASD in collaboration with Airbus. ASD has set up the automated geolocation and guidance system for drones equipped with the “Flysafe” solution. The UTM trial has been a success, and has demonstrated the efficiency and reliability of the solution, even in saturated urban environment. Are you interested in our solution to manage your low altitude airspace?